I’ve written before that bold, rich beers can be a great pairing for a fine cigar. I’m not talking about your generic, mass-produced Bud, Coors, or Miller product; I’m talking about craft brews made with an abundance of flavorful hops and malt. The Delaware-based Dogfish Head Craft Brewery is an example of a company that takes flavorful beers seriously. I’ve long been a fan of their 60 Minute and 90 Minute IPAs, which are (as you might have guessed) continuously hopped for 60 and 90 minutes, respectively. 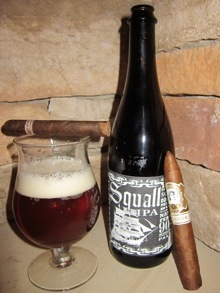 My enjoyment of Dogfish Head’s 90 Minute IPA is one reason why I was excited to try the Dogfish Head Squall IPA. At one of Dogfish Head’s “Alehouses,” Squall was described to me as the traditional 90 Minute Imperial Pale Ale bottled unfiltered and bottle-aged. The result is an aromatic brew with a deep, slightly cloudy copper color. The nose is hoppy with an inviting grapefruit tinge. Squall reveals many classic flavors from Dogfish Head’s 90 Minute IPA: rich, sweet maltiness, dried fruit, and pine. Added to the mix is a creaminess that the standard 90 Minute lacks. This is a rich beer with both power and finesse. It goes great with cigars that are similarly powerful yet refined. The Nicaraguan spice in the Tatuaje Black, Illusione, and Padilla 1932 fit the bill. I've tried this stuff… Some of the best beer I ever had. Really despite your praise, I still think you are unfeeling Squall.